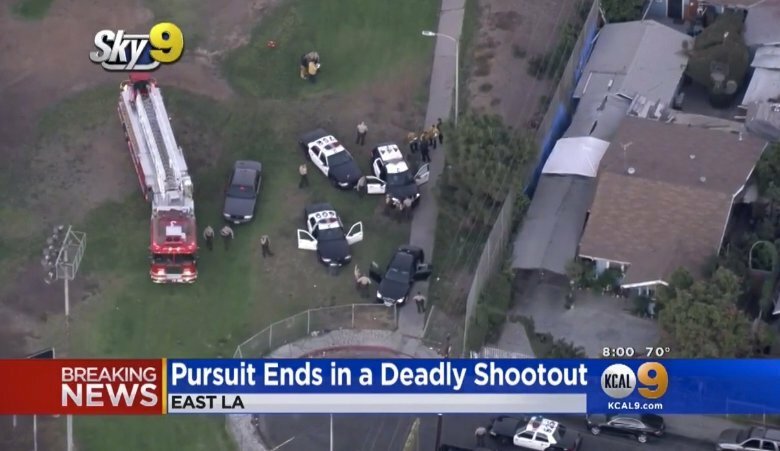 LOS ANGELES (AP) — Three men involved in a shootout that wounded two Los Angeles County sheriff’s deputies are documented gang members, detectives said Thursday. The deputies were wounded Wednesday evening while responding to calls that three men in a car were pulling up to people and asking what gang they were in while brandishing a gun in an East Los Angeles park, said sheriff’s Lt. Scott Hoglund. When three sheriff’s cars arrived, Hoglund said the black BMW the men were in abruptly stopped, and the driver got out and began shooting at deputies. Deputies returned fire, killing the driver, identified as 39-year-old Rene Herrera. Another suspected gang member, 18-year-old Fernando Cruz, also was shot and was in critical condition. The third suspected gang member, 18-year-old Hector Martinez, was booked on suspicion of attempted murder. It’s unclear if he has an attorney. One of the deputies was shot in the upper torso and has been treated and released from the hospital. The other deputy, who was shot in the jaw, remained hospitalized and was expected to survive. Three other deputies and another sheriff’s employee on a ride-along in one of the patrol cars as part of her training were uninjured. Discussion of the shootout turned political when Sheriff Jim McDonnell’s opponent in the upcoming November election held a news conference Thursday to say that understaffing within the department was a factor in the shooting and is putting deputy lives at risk. Candidate Alex Villanueva pointed to the unarmed sheriff’s employee who was in one of the patrol cars with a solo deputy. “Now the deputy is actually facing a dilemma of actually handling the problem in front of them, but they also have to safeguard the life of the person with him, who is not armed (or) prepared to handle the crisis in front of them,” said Villanueva, a retired sheriff’s lieutenant. McDonnell responded at his own news conference, calling his opponent’s criticism appalling. “That is disgusting to think that he is laying this on the backs of the deputies who are out there doing their job and blaming something other than the predators who are out there on the street who took on these deputies who are putting themselves between the public and the people who are trying to prey on the public,” McDonnell said. He said the unarmed dispatcher in the patrol car was on a routine ride-along — her third — as a standard part of training, and Villanueva “knows that.” He said she was with just one deputy because a second deputy had called in sick that day. McDonnell has previously said unbudgeted overtime and difficulties attracting recruits amid heightened police scrutiny have caused vacancies within the department. The Association for Los Angeles Deputy Sheriffs, the union representing deputies, endorsed Villanueva for sheriff last month and said in a statement late Thursday that “we have concerns that staffing vacancies and personnel management may have complicated” the shootout.